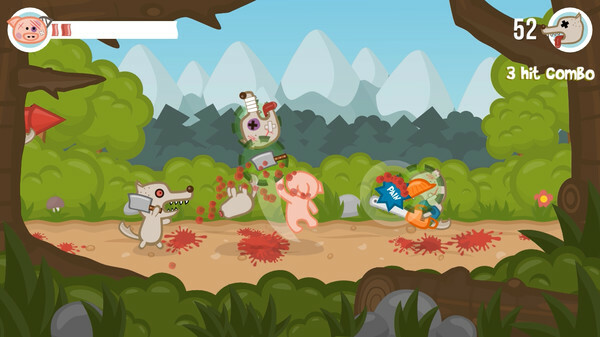 Iron Snout is a free action game available on Steam where you play as a brave pig fighting off hordes of wolves. I gave it a quick try and it's actually surprisingly engaging. It seems like an extremely simple game at first, but it relies on some really quick reaction times when it heats up a bit so it might actually surprise you. It's very much a casual game, free too so why not give it a crack? - Your old scores can be seen in "HISTORY"
I just yesterday watched the Jim Sterling video where he plays this on Itch.io. Looked fun! I'm an American* so the British political angle of it goes over my head though. I hope no one takes offense. *Meaning place of birth. I'm not a nationalistic prick like some Americans. It's sad that I feel I have to make that distinction. Very fun game. Manages to do more with 4 buttons than you might think. Duck under a flung blade, grab it, throw it back. Kick a rocket into an oncoming enemy. Backflip over a chainsaw wielding wolf, grab his hard hat, fling it at him as he runs back, grab his chainsaw out of the air, unleash your piggy fury. It's fighting distilled to it's most basic and potent form. With a pig. InverseTelecine I just yesterday watched the Jim Sterling video where he plays this on Itch.io. Looked fun!